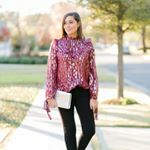 After years of ‘personal shopping’ for friends and family, I decided to start a blog to share my life through outfits, family, friends, food, travel, and life (all while playing dress up). I am a Dallas-native who is constantly raiding my mom and sister’s closets to add that chic piece to an outfit. While I love to splurge, it’s important to know when and where to cut back. I love to show how to get the look you’re going for, within any budget! My goal is to inspire you to find your style and feel confident every time you walk out the door. I hope this is a fun place for you to learn, laugh and ask lots of questions! Demographic data for @anotoriouslifestyle's audience is available for free to influence.co users.